Count on this complete guide to setting up and managing an optometric practice! Business Aspects of Optometry covers everything related to the business side of a practice — such as selecting a location and staff, equipping the office, office administration and personnel management, marketing, options for a specialty practice, controlling costs, billing and reimbursement, risk management, and financial planning. To succeed in practice, this is the one resource you need! Unique! 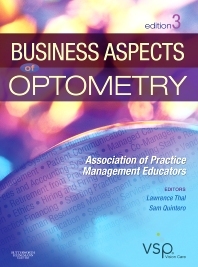 Expert authors are practice management educators who teach the course in optometry schools. A logical organization makes it easy to find practical information on managing your own practice or purchasing your own practice. Coverage of different types of ownership includes self-employment, individual proprietorships, partnerships, and corporations. Coverage of cost control issues compares the selection and use of an optical laboratory versus an in-house finishing lab. Risk management and insurance coverage provides an overview of personal, life, liability, and disability insurance. Coverage of financial planning and tax reporting discusses topics including IRAs, retirement plans, estate planning, and personal and business tax issues. Bulleted lists, tables, figures, and boxes help you locate valuable information quickly. Checklists provide a logical progression in completing tasks.